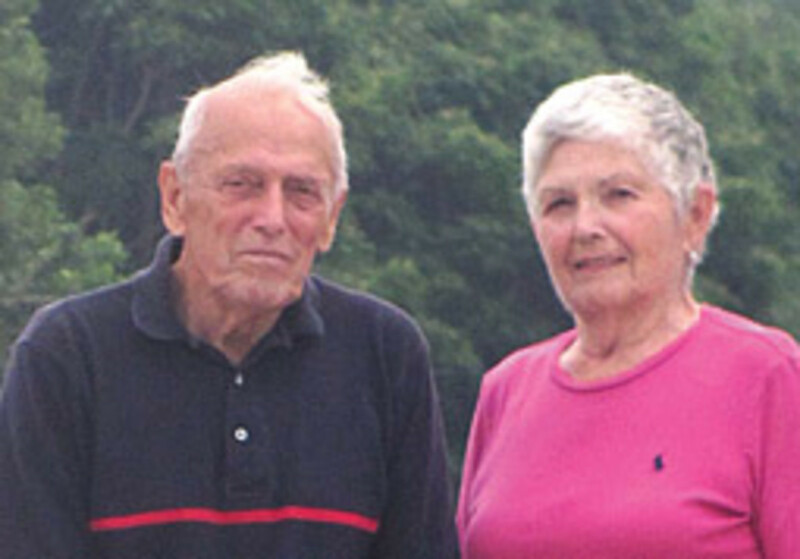 Bill and Nancy Webster have spent a lifetime boating together, dividing the duties and sharing the work and the pleasures of their avocation. 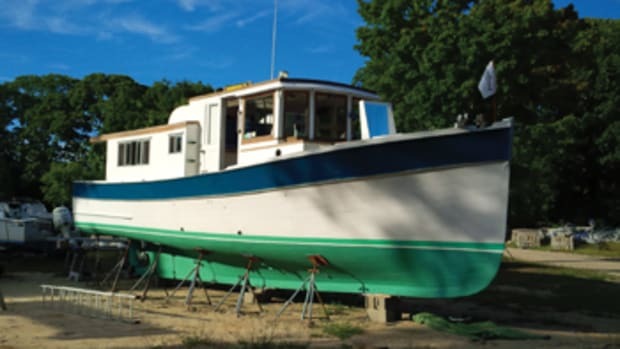 So when it came time to downsize from their much-loved 42-foot trawler, the couple from Clinton, Conn., shared the buying experience, too. And the Grand Banks 38 Eastbay EX they bought a year ago has already proved to be a good choice: seaworthy, safe and comfortable. They also wanted to “bring along” some of the things they’d grown used to in the 42, including a full galley and a roomy, versatile helm area. 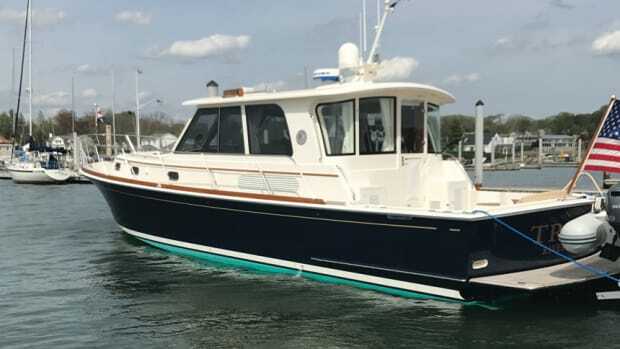 The Websters came across the 1995 38 Eastbay EX in Stuart, Fla. One test ride and survey later — working with broker Bill Full at East Coast Yachts in Yarmouth, Maine — they made the deal. The price was in the $140,000 to $180,000 range. The Websters took possession of Swamp Yankee last December, and they’ve already logged more than 1,500 miles. They took it across Florida from Stuart via the Okeechobee waterway to what the Websters call a “bit of old Florida” at the Rialto Marina in Alva. 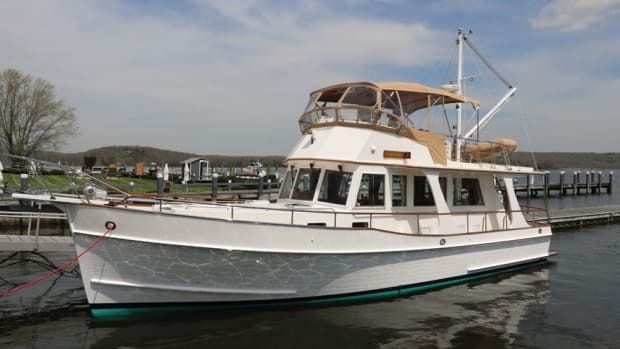 They stayed on the boat, did some cruising and crossed back to the east coast in April, then came up the Intracoastal Waterway to their Connecticut home. 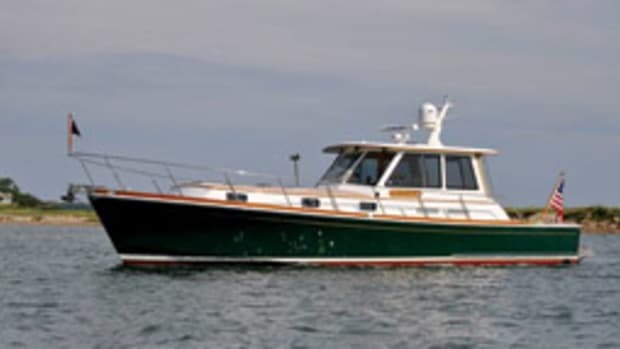 The Grand Banks 38 Eastbay EX rides a solid fiberglass deep-vee hull designed by C. Raymond Hunt Associates (topsides are Divinycell-cored). Prop pockets reduce draft to slightly more than 3 feet. The wide side decks and full-length side rails allow easy movement around the boat. The raised bridge deck (with engines below) has a well-appointed helm station to starboard, laid out with a large instrument console and room for a navigation station. Both command and bench seating were available. 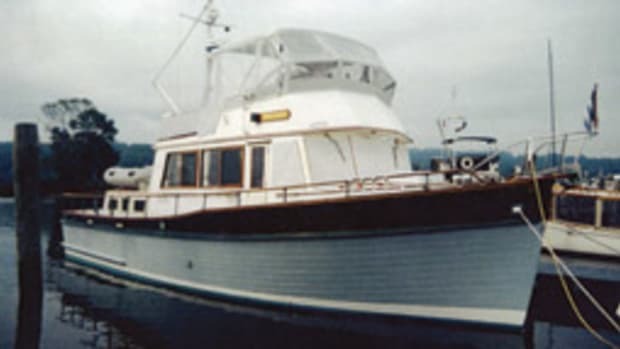 Two cabin layouts were offered through the years, and both include a full galley to port with a three-burner stove, oven and refrigerator, and space for a microwave and freezer box. There’s a C-shaped dinette/lounge to starboard. The enclosed head compartment is placed to port, and it’s equipped with a marine head, sink and shower. The difference is in the forward cabin, with V-berth and island berth options; the former allows for a slightly larger head compartment. Standard power included 300- and 375-hp Caterpillar diesels, the bigger engine allowing for a 20-knot-plus cruising speed. 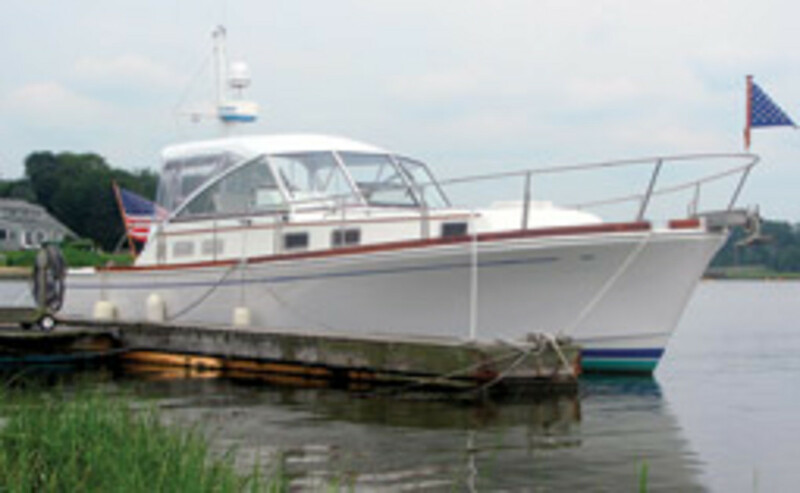 Additional features include teak decking, a swim platform and a hydraulic-assist deck hatch for engine access. Upscale elegance and traditional styling came together in 1993 with the debut of the Eastbay powerboat series. It was a new take on the lobster yacht concept, conceived and built by Grand Banks, famous since the 1960s for its trawlers. 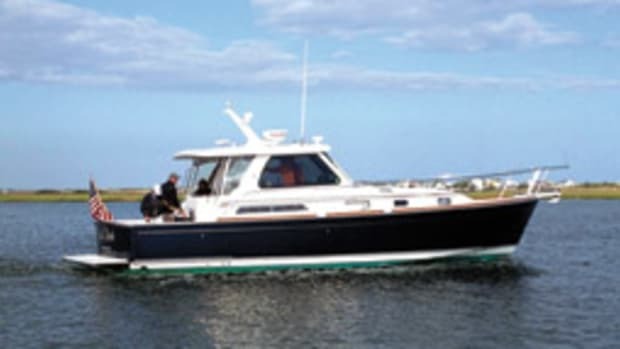 The 38 Eastbay EX’s immediate popularity led to more models: a 40-footer (1996), a 43-footer (1998) and a 49-footer (1999). 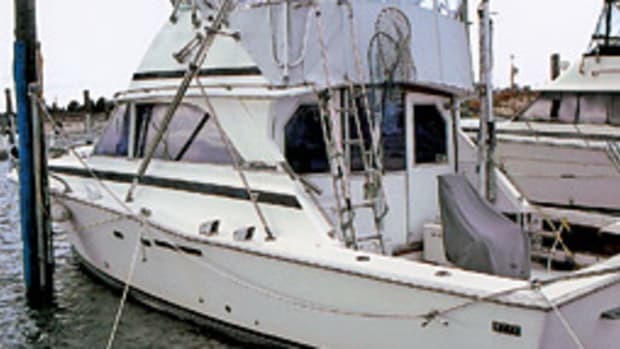 A hardtop version of the 38 was offered beginning in 2002, and more than 130 of the express boats were built during a decade-long production run that ended in 2004. Prices on the used market start in the $190,000 range and rise to $300,000-plus for well-kept newer models. 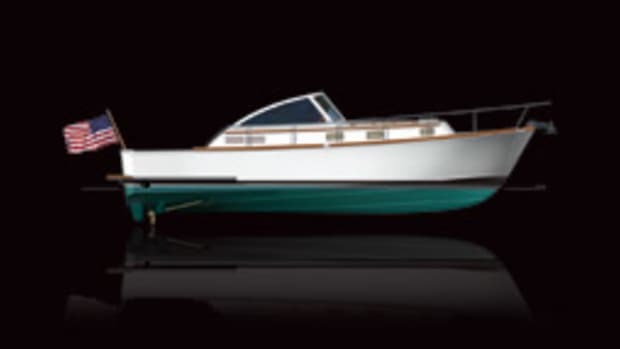 Click here to find more Grand Banks Yachts.